and Director of the Center on Capitalism and Society at Columbia University. Follow Edmund Phelps on Facebook and on Twitter. 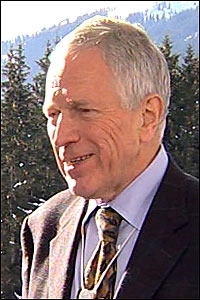 Edmund Phelps, the winner of the 2006 Nobel Prize in Economics, is Director of the Center on Capitalism and Society at Columbia University. Born in 1933, he spent his childhood in Chicago and, from age six, grew up in Hastings-on Hudson, N.Y. He attended public schools, earned his B.A. from Amherst (1955) and got his Ph.D. at Yale (1959). After a stint at RAND, he held positions at Yale and its Cowles Foundation (1960 - 1966), a professorship at Penn and finally at Columbia in 1971. He has written books on growth, unemployment theory, recessions, stagnation, inclusion, rewarding work, dynamism, indigenous innovation and the good economy. His work can be seen as a lifelong project to put “people as we know them” into economic theory. In the mid-‘60s to the early ‘80s, beginning with the “Phelps volume,” Microeconomic Foundations of Employment and Inflation Theory (1970), he pointed out that workers, customers and companies must make many decisions without full or current information; and they improvise by forming expectations to fill in for the missing information. In that framework, he studied wage-setting, mark-up rules, slow recoveries and over-shooting. This served to underpin Keynesian tenet that say a cut in the money supply will not merely cause prices and wages to drop with no prolonged effect on employment. From the mid-‘80s to the late ‘90s, he put aside the short-termism and monetarism of MIT and Chicago to develop a “structuralist” macroeconomics. Contrary to what Keynesian extremists see as unending and unexplained deficiency of “demand,” he sees employment heading to its “natural” level and seeks to explain the effects of structural forces on it. His book Structural Slumps (1994) and later papers with Hian Teck Hoon and Gylfi Zoega find an economy’s natural employment level is contracted by increases in household wealth, in overseas interest rates and by currency weakness. Thus, the big job losses in the US, UK and France result from the pile-up of wealth and puny investment, both stemming from the slowdown of productivity growth. Photos from the Center on Capitalism and Society's special conference: Women in an Inclusive Economy. Speakers included Senator Ifigenia Martínez (luncheon speaker), Patricia Armendáriz, Lisa D. Cook, Graciela Chichilnisky, Joyce DiDonato, Ianthe Dugan, Liza Featherstone, Raquel Fernández, Antara Haldar, Kim Heirston, Arianna Huffington, Merit Janow, Sylvia Nasar, Sandra Navidi, Jennifer Reingold, Carmen Reinhart, Richard Robb, Saskia Sassen, Shamina Singh, Betsey Stevenson, Anya Schiffrin, Gillian Tett, and Yang Lan. "China's economy will soon recover from the trough" interview with Edmund Phelps conducted by Grace Gu, Lujiazui Financial Network. "Ideas: Market process and real time" Carmelo Ferlito responds to Edmund Phelps's "Three Revolutions Economics Needs." 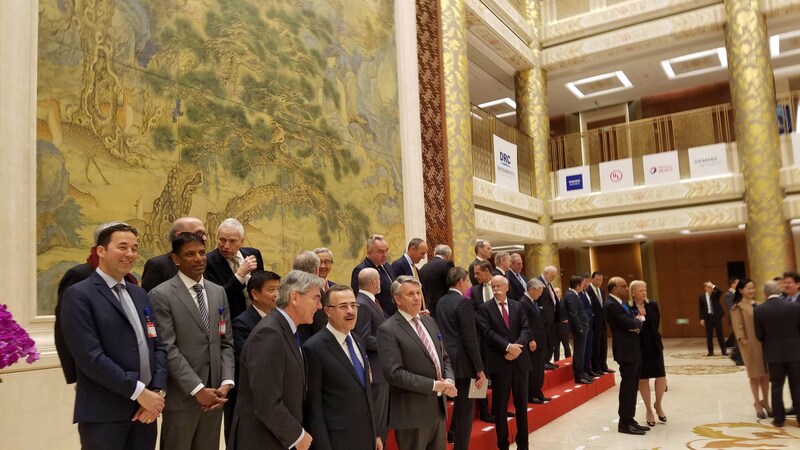 "China Development Forum: What I learned from talking with 9 global CEOs" Cheng Lei of CGTN spoke to Edmund Phelps and others. "Trump’s tax cuts will boost the US economy for two more years at most, says Nobel Prize winner" Yen Nee Lee interviews Edmund Phelps on CNBC. 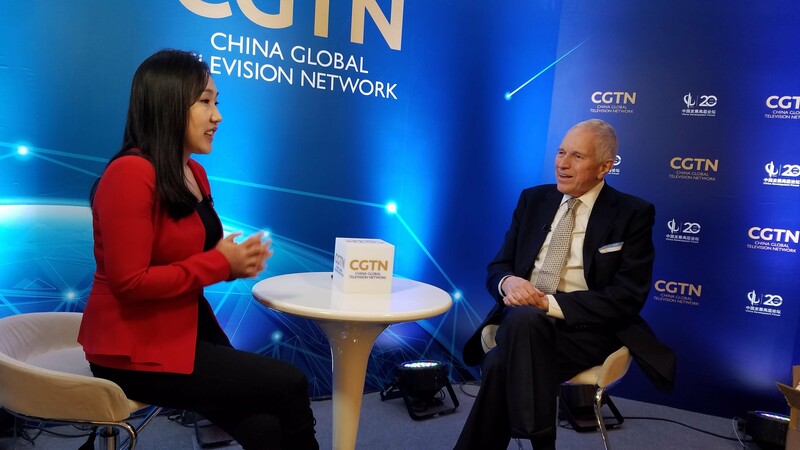 Edmund Phelps is interview on CGTN. Watch here. 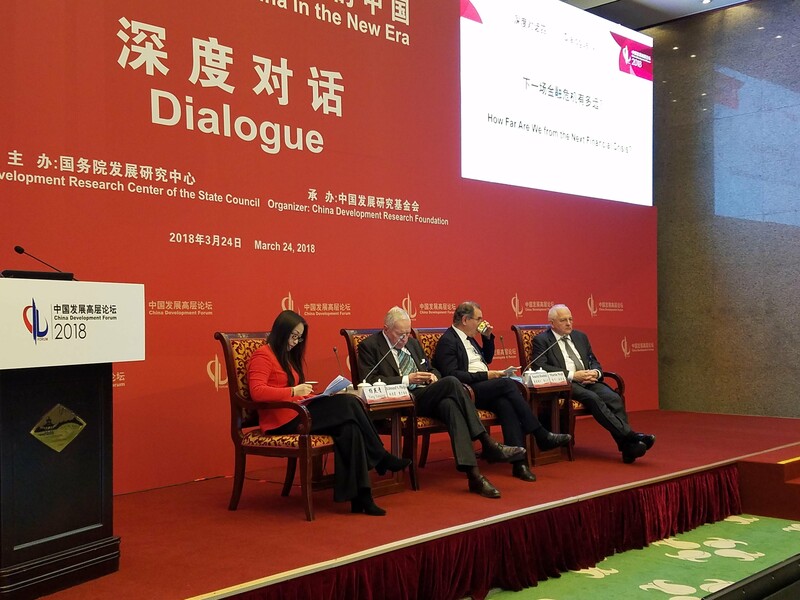 At the China Development Forum in Beijing, Edmund Phelps speaks on the panel session "Chinese Dream, American Dream: Aspiring for a Better Life.” Other speakers included WANG Shuo, Mike Leavitt, TONG Shijun, Doug DeVos, He, Fan, and YUAN Yue. Watch CCTV footage (in Chinese) here. Edmund Phelps speaks on two panels ("Macroeconomic Overview: US, China, and Europe” and “Industrial Policies, Frontier Innovation, New Technologies, and Entrepreneurship”) at China and the West: The Role of the State in Economic Growth, a conference in Beijing co-sponsored by Columbia University’s SIPA, Tsinghua University’s School of Economics and Management, and Peking University’s Institute of New Structural Economics. 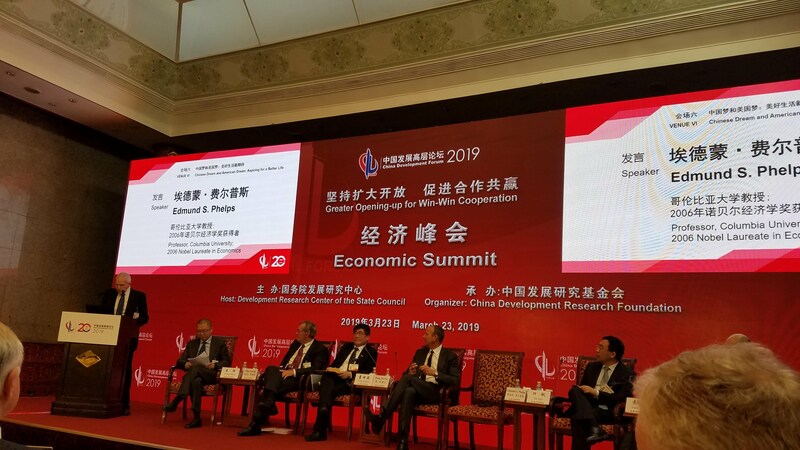 He also gave a presentation titled "The Need for a Global Patent Market," at an event hosted by the Development Research Center of the State Council of the People's Republic of China. Other speakers included Joseph Stiglitz, Michael Spence and Christopher Pissarides. Pictured below: David Li, Jacob Lew, Edmund Phelps, Peter Jungen. Edmund Phelps spoke on a panel "Corporate Governance in the Context of Global Economic Circumstances" with Bruce Greenwald, moderated by Joshua Mitts. This panel was part of a daylong conference on corporate governance counter-narratives hosted by Columbia University's Ira Millstein Center. Watch a video recording of the session here. 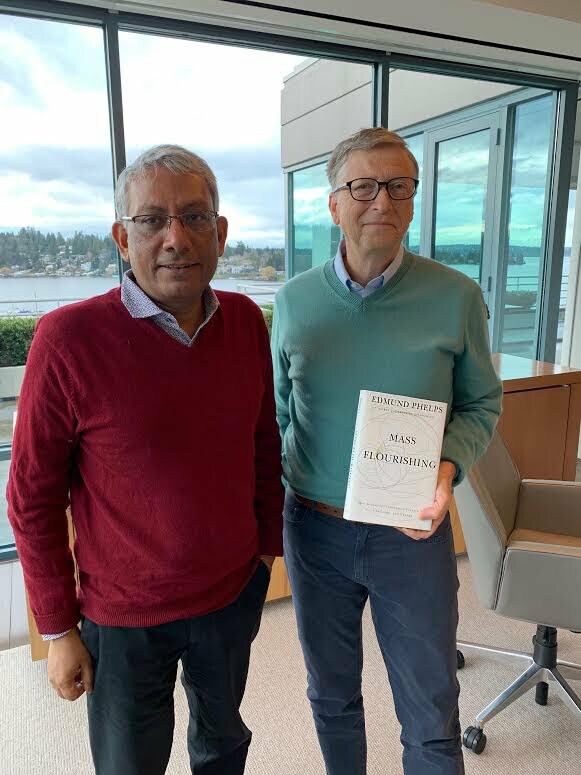 Bill Gates holding Mass Flourishing next to Ravi Venkatesan of the Global Alliance for Mass Entrepreneurship (GAME), a coalition inspired by Mass Flourishing that is attempting to enable 10M young people in India and 7M in Africa to become innovators and entrepreneurs by 2030. Bureaucracy vs Democracy Forum co-hosted by Common Good and the Center on Capitalism and Society at Columbia University. Panelists included: Patrick Foye, Francis Fukuyama, Nicole Gelinas, Heather R. Higgins, Bruce D. Homer, Sally Katzen, Paul C. Light, Robin Lake, Meghan McArdle, Paul Romer, Richard Sennett, Diana Taylor, Jeremy Waldron, Mark Whitaker, Edmund Phelps, Richard Robb. Chaired by Philip H. Howard. 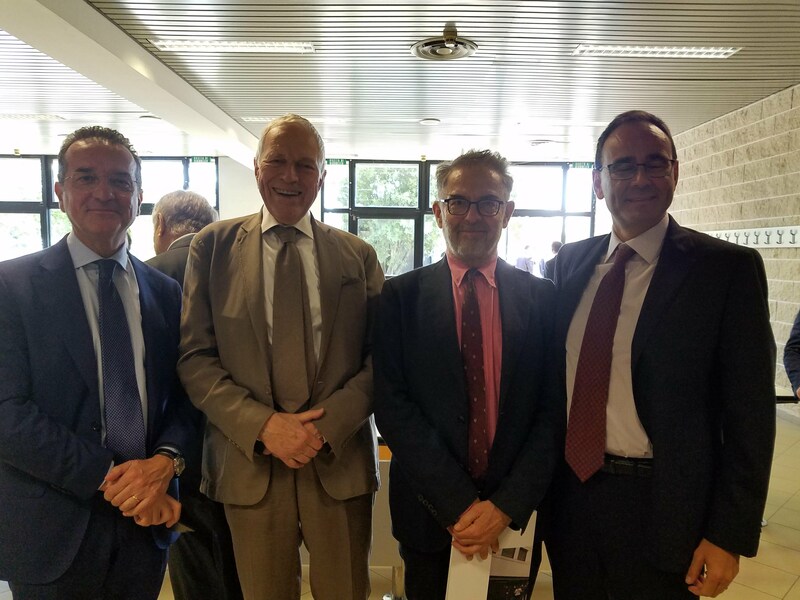 The Center on Capitalism and Society hosts Italian Minister of Economy and Finance Giovanni Tria at Columbia University's Low Library. 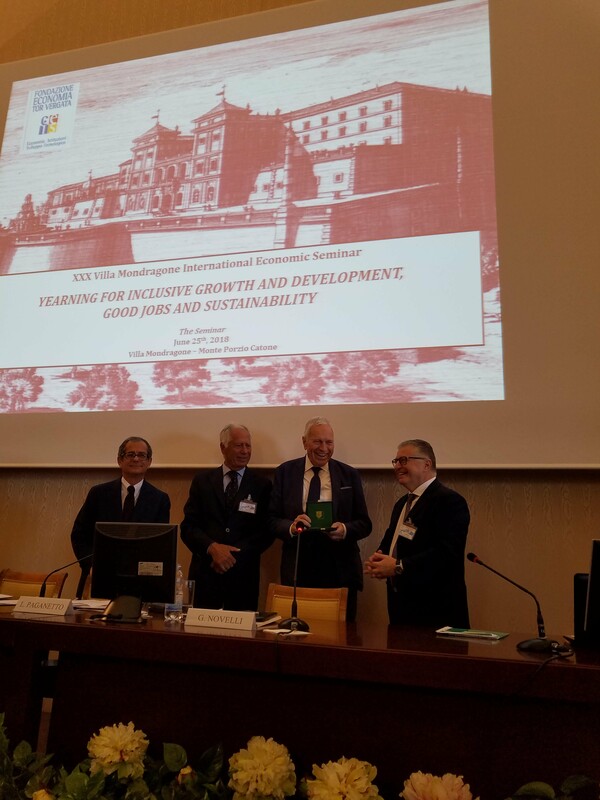 Minister Tria delivered the lecture "
Italy's Policy Challenges: In Search of a New Course." Click here for a text version of the lecture and here to view video. The Three Revolutions Economics Needs, Op-ed by Edmund Phelps published by Project Syndicate. Also in Market Watch under the title To fix Our Economic and Social Malaise, We Need to Rediscover Where Progress Comes From. 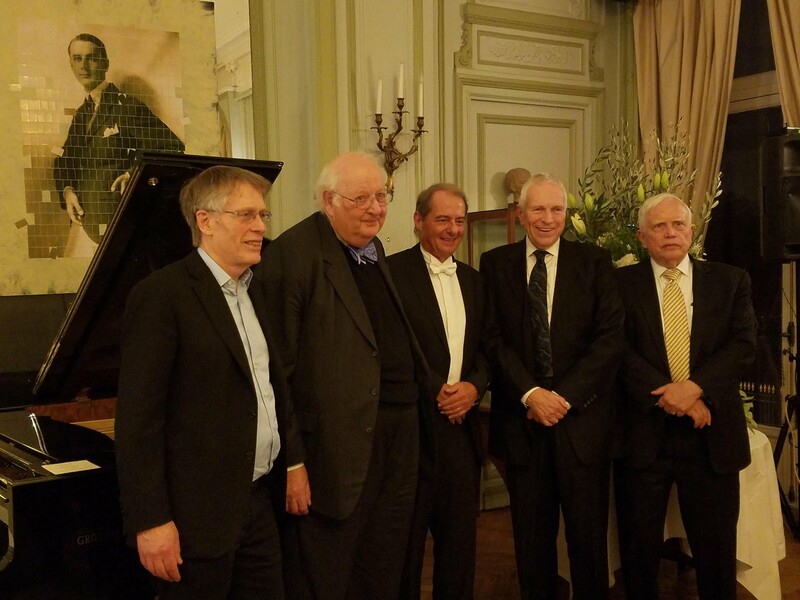 From left to right: Lars Hansen, Sir Angus Deaton, Pierre-André Chiappori, Edmund Phelps, James Heckman. Edmund Phelps participated in a roundtable at Paris-Dauphine Université on the Direction for Future Research in Economics. Other panelists in this session included Sir Angus Deaton, Lars Hansen, and James Heckman; moderated by El Mouhoub Mouhoud. Read about the event in Le Monde: "L’air du temps est décidément au grand débat, même pour la science économique." "Innovators shine light on the path" by Edmund Phelps in China Daily. 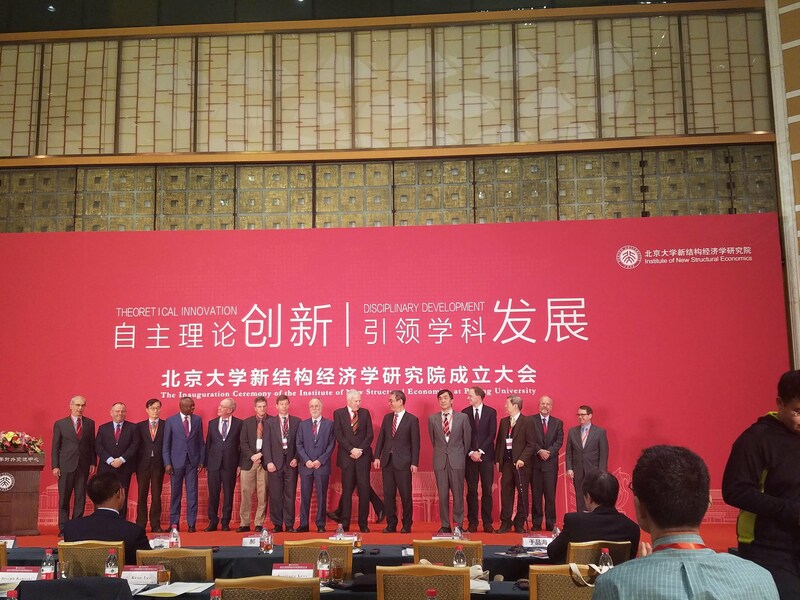 Edmund Phelps attends the inauguration ceremony of the Institute of New Structural Economics (INSE) at Peking University, Beijing. Phelps accepted Justin Yifu Lin's invitation to become a member INSE's academic advisory council. INET-INSE Joint Conference on New Structural Economics at Peking University, Beijing. Speakers and Panelists included: Justin Yifu Lin, Adair Turner, Edmund Phelps, Celestin Monga, Jack Gao, Julian Gewirtz, Ashwini Deshpande, Finn Tarp, Francis Lui, Yuan Yang, Yong Wang, Robert Johnson, Xiaodong Zhu, Roger Myuerson, Arkebe Oqubay Metiku, Folashade Soule-Kohndou, John Powell, Andrew Sheng, Weisen Li. Edmund Phelps delivered the lecture "Yes to Nourishing Dynamism, No to Stimulating Demand" at Tsinghua University in Beijing and signed copies of the second Chinese edition of Mass Flourishing (CITIC Press). "Capitalism - What Comes Next?" Vikas Shah Mbe interviews Edmund Phelps, Lawrence Summers and Sir Paul Collier for Thought Economics. "The Case for Wage Subsidies," an article in the National Review on Oren Cass's new book The Once and Future Worker, references Phelps's 1997 book Rewarding Work. "Las recomendaciones del ex vice de Dujovne para aprender economia de forma autodidacta"
Sebastian Galiani lists Phelps's textbook Political Economy has fundamental to deepening knowledge in economics. Paper "Values, institutions and the rise of Eastern Europe" with Gylfi Zoega published in Economics of Transition. Footage from "The Economic Consequences of Mr. Trump: Jobs, Wages, Trade, Growth, Health, and Satisfaction" is now available on the Center on Capitalism and Society's youtube channel. "The Fantasy of Fiscal Stimulus"
Project Syndicate, in collaboration with the Center, published "The Economic Consequences of Mr. Trump," interviews with five leading economists about the US economy during Trump's presidency. The piece was filmed on the occasion of the Center's 16th annual conference on Trump this September 17th at Columbia University. Watch Edmund Phelps, Barry Eichengreen, Glenn Hubbard, Rana Foroohar and Angus Deaton. Watch here. October 4, 2018Edmund Phelps appeared on the panel “Politics, Policy, and Risk,” at the Santa Fe Institute's conference Risk : Retrospective Lessons & Prospective Strategies which was held at Morgan Stanley in New York. "Nobel Prize in Economics Phelps predicts recession in the US within a year"
Interview with Die Presse, also in Gestion and 20 Minutes. Photos from the Center on Capitalism and Society's 16th Annual Conference: The Economic Consequences of Mr. Trump: Job, Wages, Trade, Growth, Health and Satisfaction held at Columbia University. Speakers include Robert Aliber, Edmond Alphandéry, Charles Calomiris, Sir Angus Deaton, Barry Eichengreen, Rana Foroohar, Roman Frydman, Jason Furman, David Goldman, Geoff Heal, Philip K. Howard, Glenn Hubbard, Laurence Kotlikoff, Edward Luce, Sandra Navidi, Edmund Phelps, Richard Robb, Jeffrey Sachs, Richard Sennett, Joseph Stiglitz and Nicholas Wapshott. Edmund Phelps delivers the paper, "Two Kinds of Robots in Growth Models: An Introduction" at the NBER Conference Economics of Artificial Intelligence in Toronto. Edmund Phelps delivers a keynote speech titled "Trying to Improve a Future that is Seriously Unknown" at The 2008 Global Financial Crisis in Retrospect Conference held at the University of Iceland, Reykjavik. The Need for a Global Patent Market published by Project Syndicate. "L’ignorance économique des Français plombe la croissance"
"Three Speeches on Europe: Berlin, Barcelona, Rome" by Edmund Phelps is available to read on the Center on Capitalism and Society website. Alberto Petrucci, Edmund Phelps, Francesco Nucci and Ernesto Felli at Tor Vergata University, Rome. 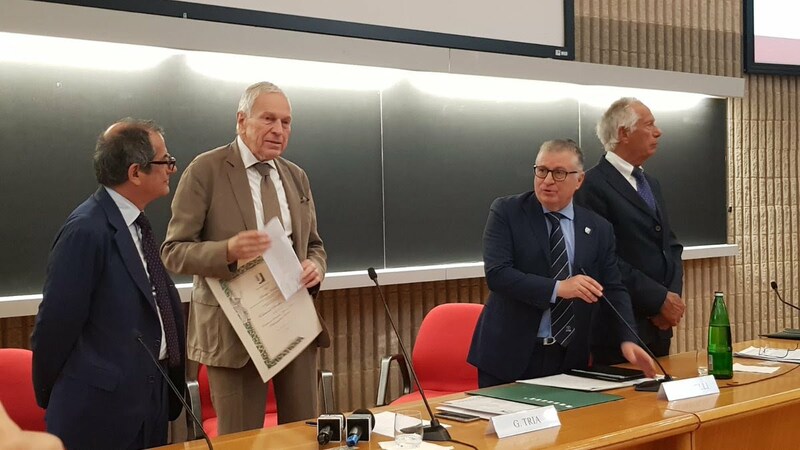 Edmund Phelps is presented with a Distinguished Professor award from University Tor Vergata, Rome for his high merits in the field of economics. Edmund Phelps receiving Tor Vergata Medal at the 30th Villa Mondragone International Economic Seminar in Rome. 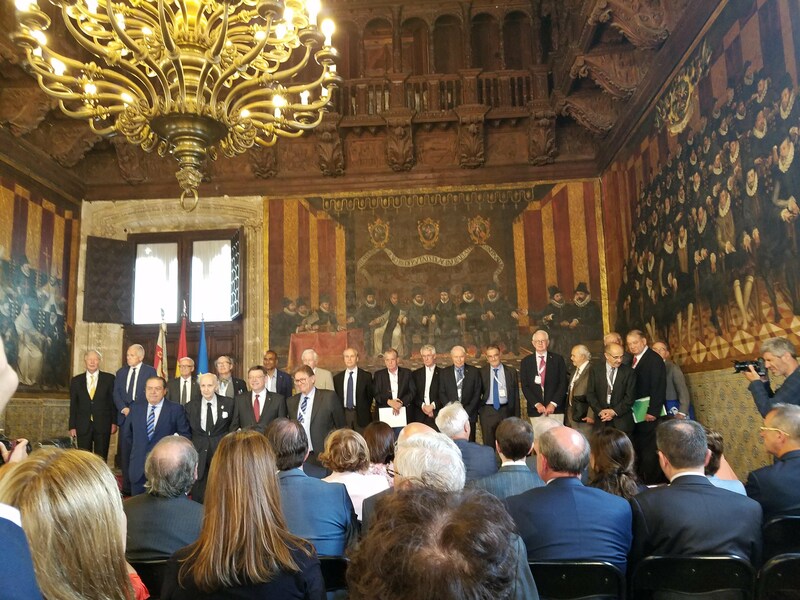 Edmund Phelps served as a juror for the Rey Jaime I Prize in Economics 2018, Palau de la Generalitat, Valencia. Edmund Phelps delivers a lecture on grassroots innovation to the students of EDEM Business School in Valencia. Edmund Phelps with Javier Quesada, President of the Rey Jaime I Awards Foundation at EDEM Business School in Valencia. Right:Edmund Phelps signs a copy of his book Mass Flourishing (Princeton, 2013) to Javier Quesada, President of the Rey Jaime I Awards Foundation. 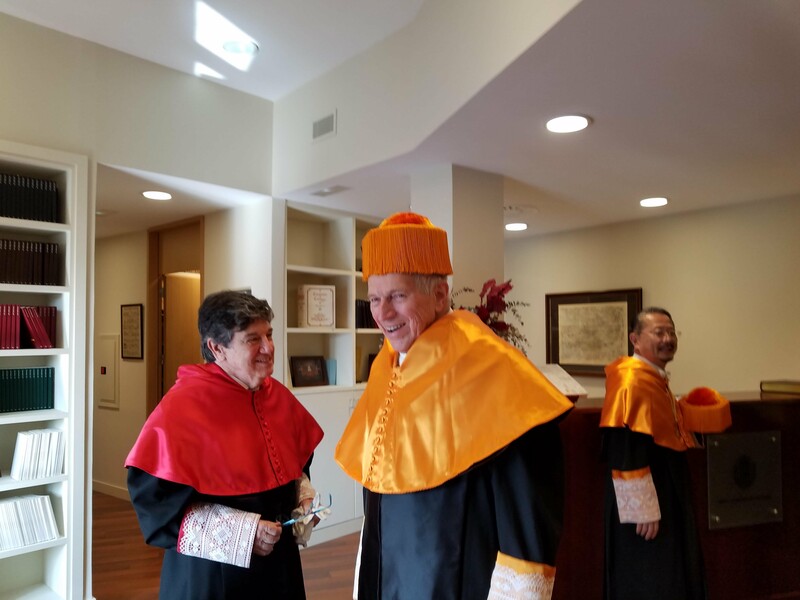 Center on Capitalism and Society foreign member Juan Vincente Sola and Edmund Phelps before Sola's induction into the Royal European Academy of Doctors in Barcelona. Edmund Phelps with Dr. José Ramón Calvo of the Royal European Academy of Doctors in Barcelona. Edmund Phelps delivers keynote speech during the session called "Turning Around the Downward Spiral of Economic, Social and Political Cohesion" at the Global Solutions Summit 2018 in Berlin. See more photos on twitter. 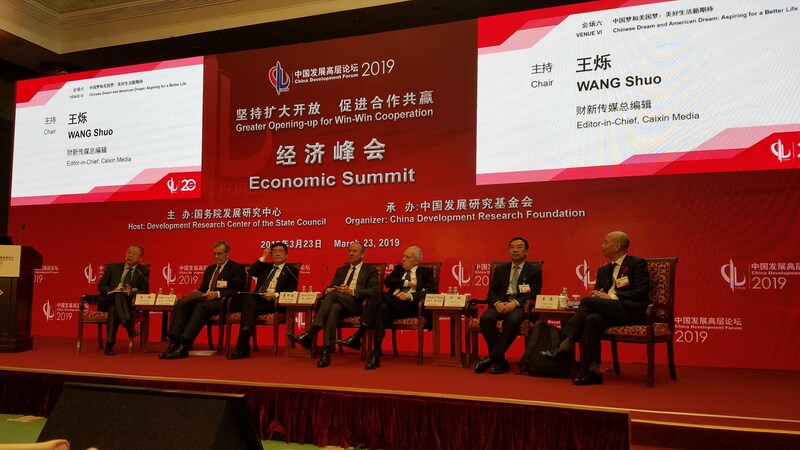 Edmund Phelps participated in the World Economic Forum meeting of the Digital Economics Group co-hosted by MIT's Initiative on the Digital Economy and Columbia University's SIPA. The meeting was held at the WEF offices in New York. 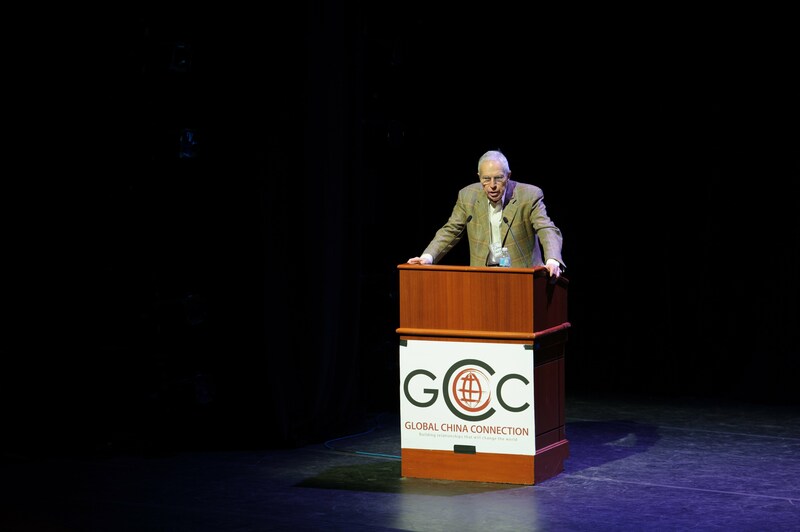 "How Milton Friedman and Edmund Phelps changed macroeconomics"
Edmund Phelps delivers keynote speech at the NYU Skirball Center to close the conference "China's Transformation: A Decade of Innovation" which was co-hosted by Global China Connection and NYU. Read about the event (in Chinese) here. "China should turn to 'good economy'"
Edmund Phelps, Nouriel Roubini, and Martin Wolf at the China Development Forum in Beijing. This sessions was called "How Far Are We From the Next Financial Crisis?" 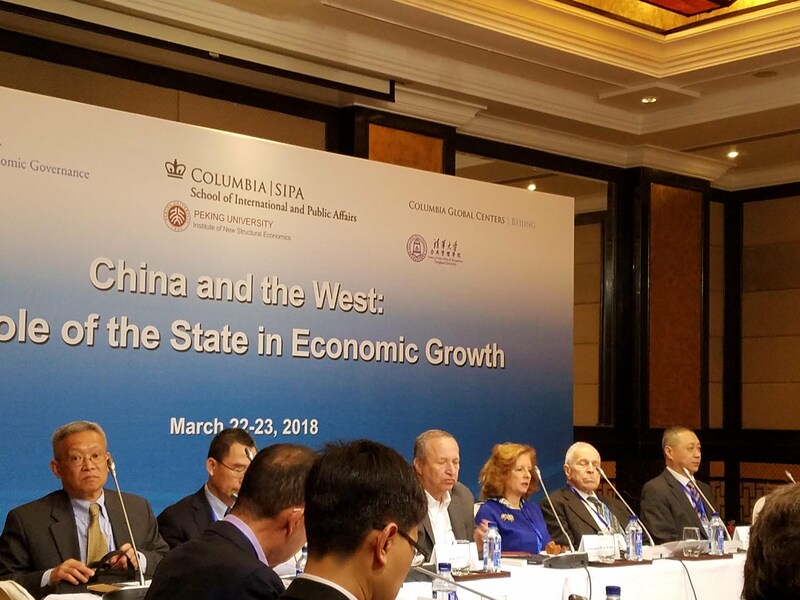 China and the West: the Role of the State in Economic Growth Conference co-sponsored by Columbia University SIPA, Peking University, and Tsinghua University, Beijing. The picture above is from Session III: The Role of Innovation and the Digital Economy: New Opportunities and Challenges for Governance.Some notable participants include: Larry Summers, Merit Janow, and Edmund Phelps. China and the West: the Role of the State in Economic Growth Conference co-sponsored by Columbia University SIPA, Peking University, and Tsinghua University, Beijing.The above photo is from Open Session: The Future of Global Economic Relations: Lessons from China, the EU, the US and Beyond. Participants included: Lan Yang, Merit E. Janow, Justin Yifu Lin, Edmund Phelps, Yan Mei, Jeffrey Sachs, Pun Hoi Yu, Jun Zhang, Jan Svejnar, Haizhou Huang. China and the West: the Role of the State in Economic Growth Conference co-sponsored by Columbia University SIPA, Peking University, and Tsinghua University, Beijing. 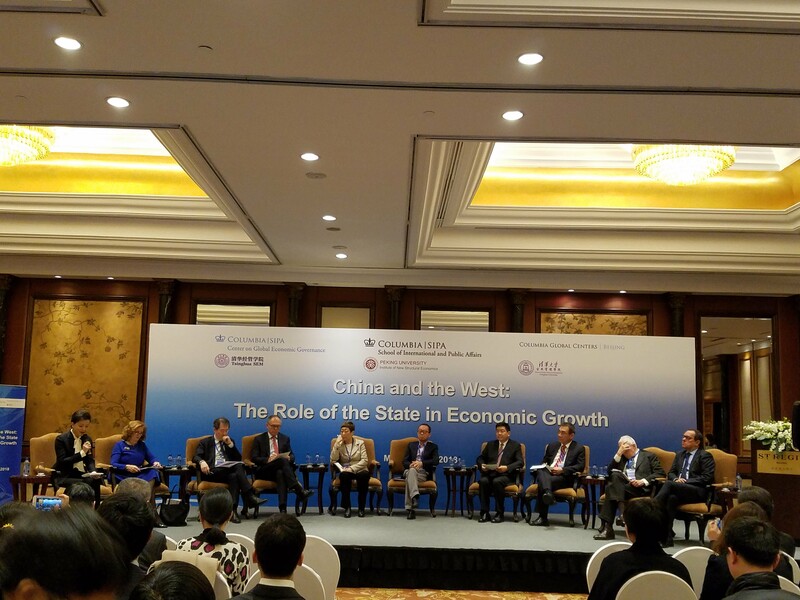 The above photo is from Session I: Changes in Chinese, US and European Economic Policy chaired by Jan Svejnar. 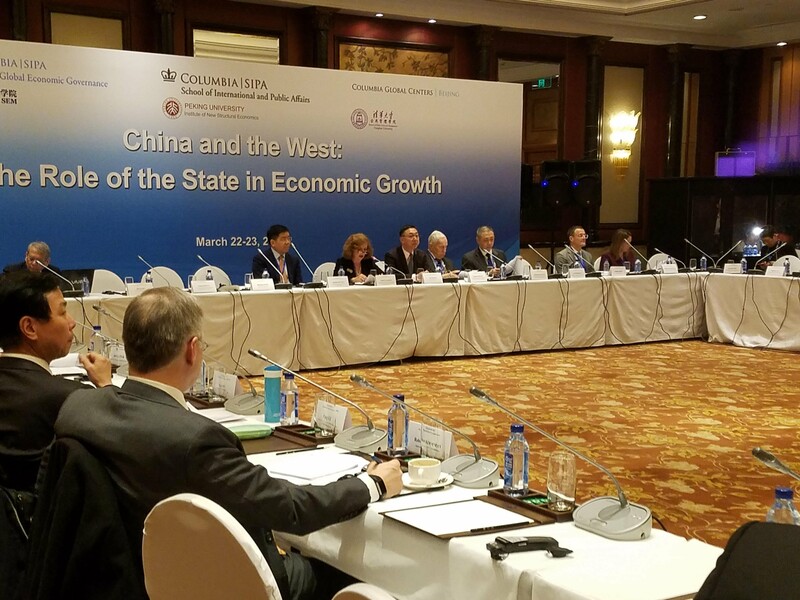 Participants in the session included: Jacob J. Lew, Justin Yifu Lin, Pun Hoi Yu, Jacob Frenkel, Edmund Phelps, Min Zhu, Feng Lu, David Daokui Li, Ping Chen, Rakesh Mohan, Yifei Li, Yong Liu, and Stephen Green. In an op-ed piece published today by Project Syndicate, Edmund Phelps points out that China, two years ago, adopted a policy to refrain from protecting incumbent enterprises from the entry of new firms with better ideas, and it has been rewarded with the revival of productivity growth. In contrast, the West has made it a policy to protect incumbent firms from competition by newcomers, and it has suffered from decades of slow productivity growth: "Will China Out-Innovate the West?" 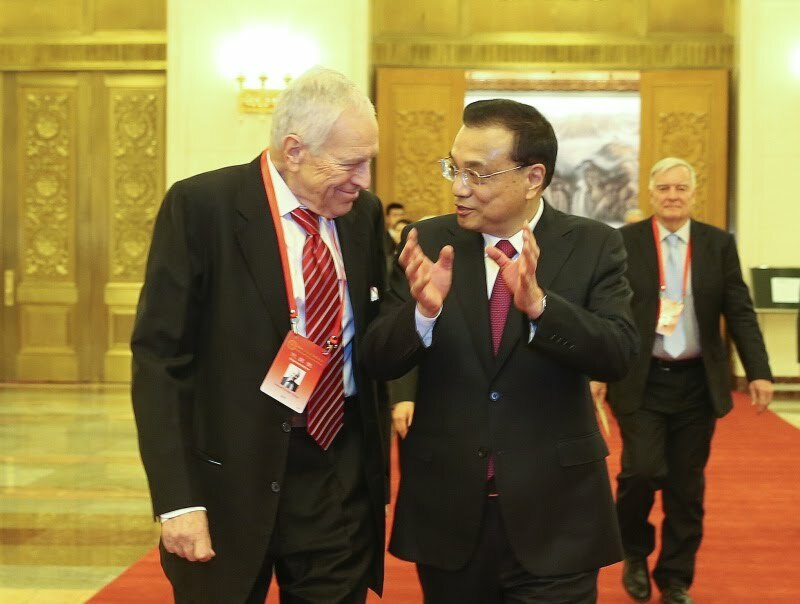 Edmund Phelps discusses Mass Flourishing with David Blair of China Daily, Europe: "Finding opportunities to flourish"
Premier Li Keqiang remarks on the importance of Phelps's "Mass Flourishing" in China's new era of innovation: click here. Edmund Phelps publishes op-ed "Economic Policymaking in the Age of Trump" in Project Syndicate. Edmund Phelps participates in the video conference call Ensuring A Dynamic, Innovative, and Flourishing Economy: Policy Thinking in the Age of Trump and delivers an edited version of his speech "A Vital People: A Necessity for a Good Economy." The call was hosted by DisruptDC. Edmund Phelps receives Honoris Causa from Libera Università Internazionale degli Studi Sociali Guido Carli (LUISS) in Rome, Italy. Read the Italian translation of Edmund Phelps's acceptance speech in the Italian newspaper Il Sole 24 Ore here. The English version can be found on the Center of Capitalism and Society's website: click here. 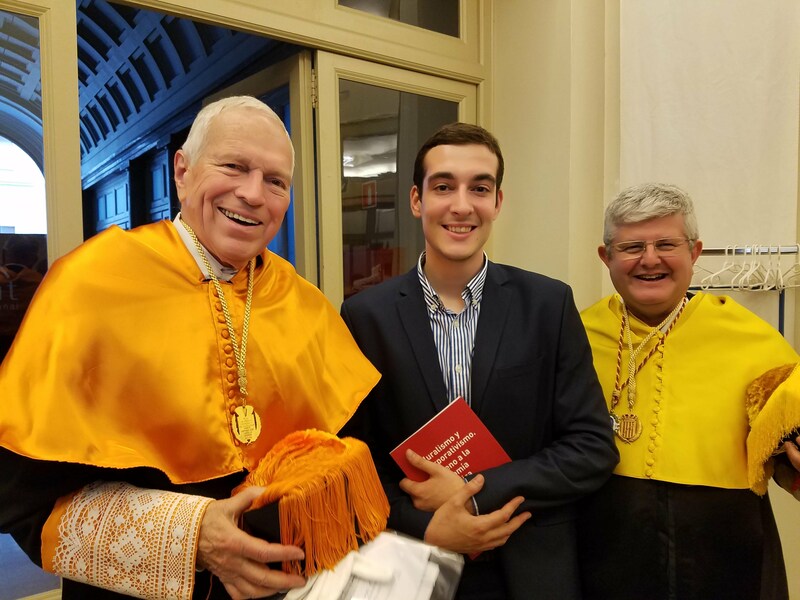 To read a post-ceremony interview between journalist Nicola Lillo and Edmund Phelps in the Italian newspaper La Stampa click here. Video of the ceremony can be viewed here. Photo descriptions (left to right): Edmund Phelps with Honoris Causa medal; Edmund Phelps delivering acceptance speech "A Vital People: A Necessity for a Good Economy"; Edmund Phelps with Jean-Paul Fittoussi and Lucio Scandizzo; Edmund Phelps with Franceso Nucci and Giovanni Tria; Edmund Phelps with Giorgio di Giorgio and Anton Muscatelli. Trump 'Seriously Stumbled' on Tax Law, Nobel Winner Phelps Says on Bloomberg: watch here. Edmund Phelps speaks on the panel TrumpEconomics: A First Year Evaluation with Olivier Blanchard, Joseph Stiglitz, and Lawrence Summers, moderated by Dominick Salvatore at the ASSA Annual Meeting of the American Economic Association. Watch a recording of the session here (Phelps beginning at 33:33). To read the text versions of all the presentations in this session click here. Read James Pethokoukis's review of Edmund Phelps's paper on the American Enterprise Institute's website here. Roman Frydman and Edmund Phelps publish op-ed in MarketWatch: "Why it’s impossible to predict the effect of the tax bill on investment and growth"
"Higher Education: Transformation or Reformation?" Edmund Phelps speaks on the importance of modern values and restoring America's economic dynamism at the Museum of American Finance. Edmund Phelps signing copies of Mass Flourishing at the Museum of American Finance's conference "Restoring American Economic Dynamism." Edmund Phelps on Bloomberg Markets discussing the Federal Reserve Chairman Nominee Jerome Powell, "Will Jay Powell Tip Hand at Confirmation Hearing?" 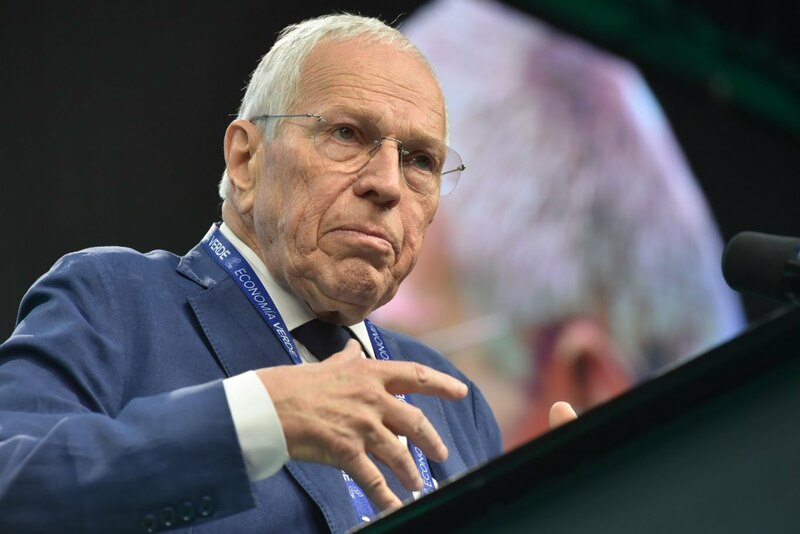 Edmund Phelps discusses innovation on France Culture radio: "L’esprit innovant d’Edmund Phelps "
Edmund Phelps delivers speech, "France: Becoming an 'Innovation Nation' Again" at the Ministry of Economy and Finance in Paris. Listen to Edmund Phelps on Bloomberg Surveillance: "Edmund Phelps Says It’d Be Good to Try Higher Interest Rates." Edmund Phelps on Bloomberg Markets this morning: "Nobel Laureate Phelps on Inflation and Fed Policy"
James Mackintosh covers the Center on Capitalism and Society's 15th Annual Conference in the Wall Street Journal: "What 500 Years of Protestantism Teaches Us About Capitalism’s Future." A new op-ed by Edmund Phelps in Project Syndicate: "Nothing Natural About the Natural Rate of Unemployment." A selection of photos from the Center on Capitalism and Society's 15th Annual Conference: The Age of the Individual 500 Years Ago Today. The conference was held at Columbia's Low Memorial Library. From more information and for video footage from the conference click here. From left to right, top to bottom: Roman Frydman and Michael Woodford; Richard Robb, David Sidorsky, George Rupp, Richard Sennett; Peter Jungen and Edmund Phelps; Richard Sennett and Saskia Sassen;Robert Shiller; Edmund Phelps; Jean-Paul Fitoussi and Edmund Phelps. President Barack Obama with Edmund Phelps at the Second Green Economy Summit in Córdoba, Argentina. 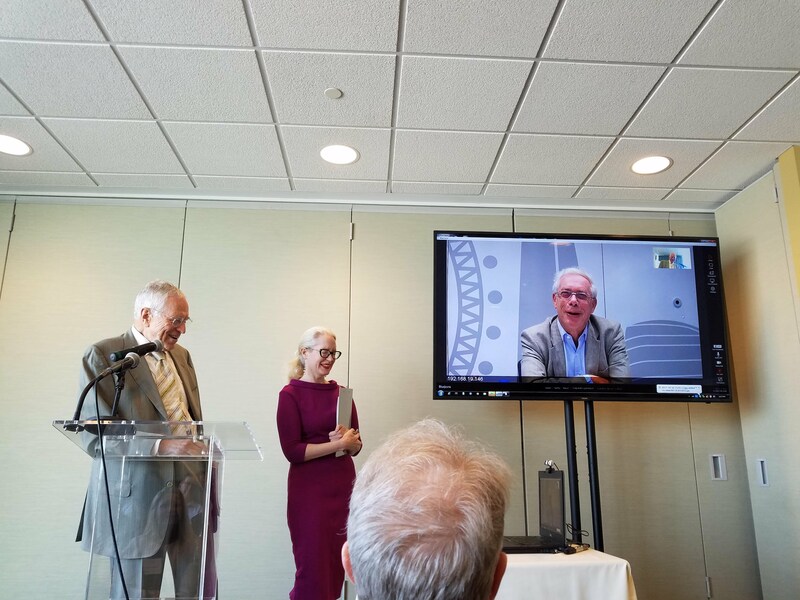 Edmund Phelps with Katherine Venice of Ethical Capitalism and John Kay at the UN Headquarters in New York. Phelps delivered a speech on innovation followed by discussion and Q & A with John Kay. "Premio Nobel de economía asegura que 'el cambio climático se ha vuelto muy costoso'"
In Córdoba, Argentina, Edmund Phelps gave the keynote address "Saving the Environment" at the Advanced Leadership Foundation's Second Green Economy Summit. 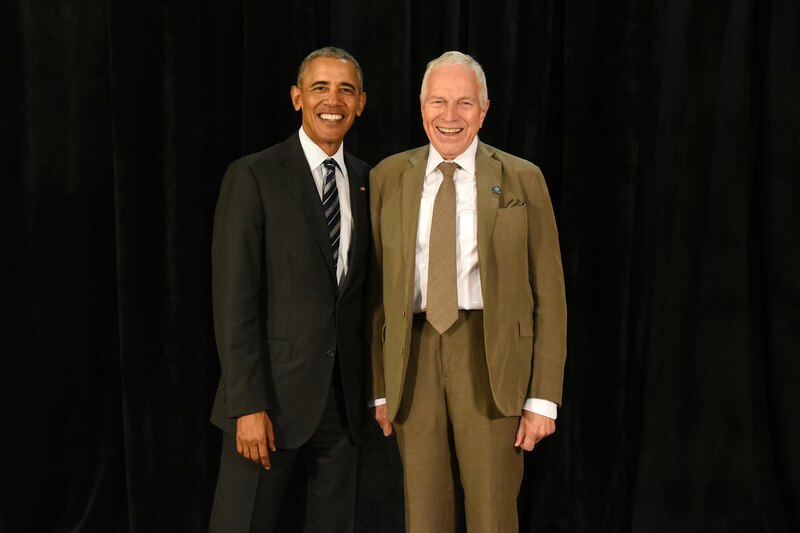 Other speakers included President Barack Obama, and Nobel Laureate Eric Maskin. Read an interview between Gabriela Origlia and Sofía Diamante from La Nacion and Edmund Phelps about the event here: link. An additional interview with Martni Dinatale and Juan Parilla of Infobae can be read here: link . Edmund Phelps signs copies of Una Prosperidad Inaudita (RBA, 2017), the Spanish translation of Mass Flourishing at the Second Green Economy Summit. "La prosperidad, según E. S. Phelps"
"Tres Premios Nobel Disertarán En Córdoba"
"This Thing Called the American Dream"
"The natural rate of unemployment"
"Bloc-notes : Quelle croissance pour la Tunisie?"